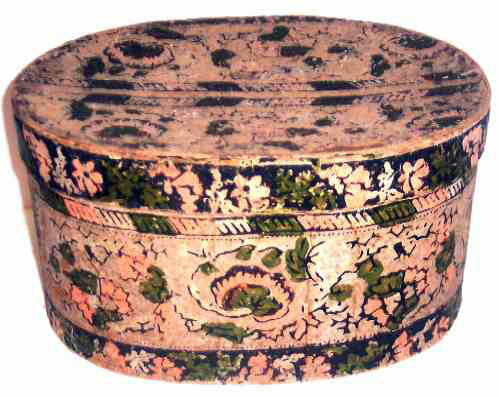 Presented here, a wonderful Wallpaper Covered Box or "Bandbox". They were used by both men and women to store or carry articles of wearing apparel and hats. During the second quarter of the 19th C. the use of Bandboxes reached their height and the majority were made pasteboard covered with colorful printed or stenciled papers, some of which were pieces of actual wallpaper, although others were individually designed for bandbox decoration. Bandboxes were made in nests of progressive sizes for convenience in storing and transporting light articles of ladies' apparel. This is one of the smaller ones and most likely would have been used for gloves, laces, ribbons, beads or other oddments of feminine attire or perhaps a workbox or for holding children's treasures. For ease of transportation, strong cotton bags were frequently made to fit exactly around the bandbox and when pulled up and securely tied the cord served as a useful handle. This might go far to explain the fine condition on this particular box which still retains it's lovely color (a bit lighter on the top) and shows only minimum wear, mostly on the bottom edge and the edge of the top as one would expect from age and usage.